Waaaay back in 1982, the wargames industry was reeling from the death of SPI. Meanwhile, roleplaying games were the new hotness as TSR was hitting its stride. Dungeons and Dragons had firmly usurped the time and dollars of the gaming public and Gary Gygax sat perched on the teetering throne called TSR. Fantasy Games Unlimited, which had been busy publishing wargames during the 1970s, saw an opportunity in the changing market and shifted gears towards publishing roleplaying games. 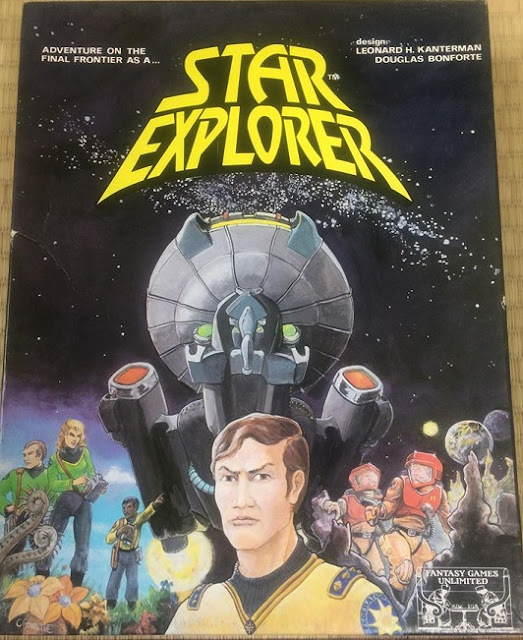 One of the results was a game called "Star Trek"...I mean, "Star Explorer", which billed itself as a "role playing boardgame" that allowed you to step into the shoes of a StarShip [sic] captain of the Federation.